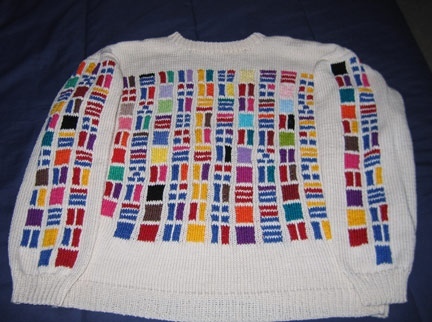 Certified math nut Sondra Eklund has made an awesome sweater. Before you read her explanation, take a look at it and see if you can figure out how it works. Of course, the synesthete in me says her color choices are all wrong. But she’s coloring a different animal here (primes, not numerals) so there’s no real way to be “right”. Regardless, I want this as a T-shirt! The great confluence of geeky and crafty continues! Jacob Haller is knitting a Moebius Strip. 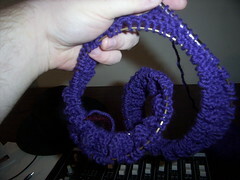 With purple yarn, no less. I stumbled upon it while searching for images for this conversation about edgeless jigsaw puzzles. Makes me glad to be alive, this does.